Internet Download Manager (IDM) is a leading download accelerator tool among web users.By using this tool we can download files even from youtube at high speed. The IDM providing from its official site is a 30 day trial version, after that it asks for serial key or to buy.So here is the step to change it to full version for life time without crack/patch and no further registration is needed. Step 1: Download the IDM trial version or If you already have IDM installed Update it( Help>> Check for Updates). Step 2: Then you will see a dialog box asking for Name,Last name, Email address and serial key. Step 3: Fill the first 3 and put any of the following in the serial key option. Step 4: After some time, you will see an error message(some times it shown in next restart) that saying You have registered IDM using a fake serial key and IDM will exit.Now here the trick starts. Step 5: Go to Start then click on Run (win+R) and type the text below and click enter. 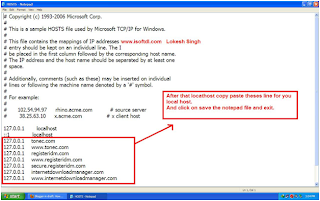 Now copy the below lines of code and add to host file as shown above. After adding the text above, save the notepad file and exit. Done!! Your Internet Download manager is now registered to full version, open IDM and click on Help>>About IDM to make sure it is full version. On updating your IDM will not expire and you can use it for life time. 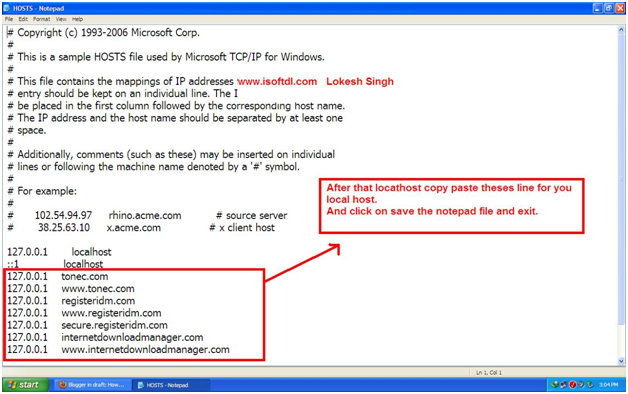 Note : If you are not able to save the host file, follow these steps to make it save. Go to C drive>> Windows>>System32>>Drivers>>Etc. then you will see the hosts file. Right click on the hosts file >>Properties>>security>>select administrator account( in group or usernames field)>>edit( to change permissions)>>Allow these options: full control,read and write>> click on apply>> OK.
Now you will be able to make changes in hosts file.